With more than 5,000 entries totaling over a million words, this is the most comprehensive and authoritative dictionary of Buddhism ever produced in English. It is also the first to cover terms from all of the canonical Buddhist languages and traditions: Sanskrit, Pali, Tibetan, Chinese, Japanese, and Korean. 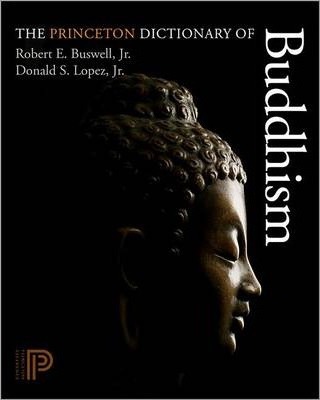 Unlike reference works that focus on a single Buddhist language or school, The Princeton Dictionary of Buddhism bridges the major Buddhist traditions to provide encyclopedic coverage of the most important terms, concepts, texts, authors, deities, schools, monasteries, and geographical sites from across the history of Buddhism. The main entries offer both a brief definition and a substantial short essay on the broader meaning and significance of the term covered. Extensive cross-references allow readers to find related terms and concepts. An appendix of Buddhist lists (for example, the four noble truths and the thirty-two marks of the Buddha), a timeline, six maps, and two diagrams are also included. Illustrations note 2 line illus. 1 table. 6 maps. Robert E. Buswell Jr. holds the Irving and Jean Stone Endowed Chair in Humanities at the University of California, Los Angeles, where he is also Distinguished Professor of Buddhist Studies and founding director of the Center for Buddhist Studies. He is the editor-in-chief of the two-volume Encyclopedia of Buddhism and the author of The Zen Monastic Experience (Princeton), among many other books. Donald S. Lopez Jr. is the Arthur E. Link Distinguished University Professor of Buddhist and Tibetan Studies at the University of Michigan. He is the author of The Tibetan Book of the Dead: A Biography and the editor of Buddhism in Practice (both Princeton), among many other books.